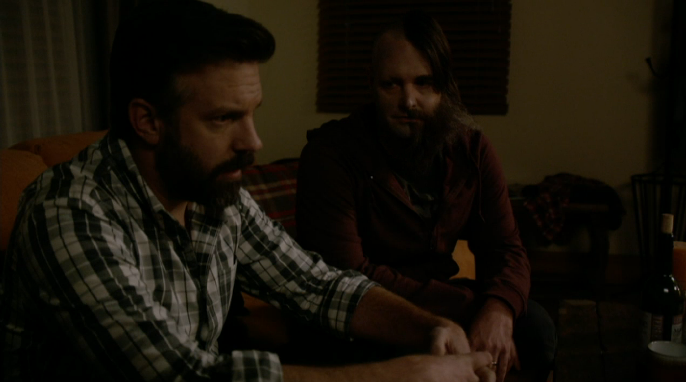 On this week’s episode of The Last Man on Earth, the Mike and Tandy feud boils over into a cartoonish back-and-forth that while funny at times, feels like the wrong path for this show to go down. At the end of last week, it was revealed that Mike got back at Tandy for embarrassing him by shaving half of his hair. Tandy claims he likes the shearing just to get back at Mike, but since he’s a terrible liar, no one likes him. Some of the burns the gang gets at Tandy are great (Erica “you look like two different serial killers”) and the scene plays well, but it sets up a “prank war” story line that brings out the worst in both men. Carol urges Tandy to not go any further with “getting back” at Mike. She argues they’re even from Tandy humiliating him at the amphitheater, but knowing Tandy, that’s not going to happen. First Tandy fills the blanket Mike is sleeping on with poison oak, but then discovers a Christmas present from Mike. The gift box is filled with completely useless money … and also an anti-theft in trap that turns Tandy’s face blue. After a quick makeup application that makes him look like a corpse, Tandy moves on to discovering the new house where Mike has moved to. Wearing a camouflage leaf suit, Tandy tracks Mike to his house and is promptly confronted. Tandy’s web of excuses and Mike’s nonchalance are fairly ridiculous, exaggerated versions of these characters. Eventually, Mike convinces Tandy to rub poison oak on his nether regions to convince him it’s not the “gift” he is bringing him. Of course, Mike is no fool; he knew it was poison oak. The next morning, Tandy rolls out of bed and off of a cliff. Basically, this prank war has turned the Miller brothers into Bugs Bunny and Daffy Duck. The prank war has taken a significant toll on Tandy’s psyche. Todd notices and wants to help Tandy, which results in him shaving off half of his hair and mustache. This goes nowhere since Mike folds quickly. Carol again enters the episode as the voice of reason and suggests Tandy share with Mike pictures of them as children. Tandy uses this idea to ill means and threatens to destroy a letter their mother wrote to Mike unless he backs off. Mike finds the letter immediately and it’s bogus. Of course it is. Eventually, Tandy takes pity on Mike and shows him the real letters their parents wrote to him while he was in space as the entire world was dying. It’s sweet and I hope this show moves on from the Tandy vs. Mike thing because it has been grating these past few episodes. As for the other plot, the Todd triangle has no momentum this week. He’s been having problems getting used to the new situation between himself, Gail and Melissa and overshares information about one to the other. This plot is really going nowhere and I hope that the writes can find a better B-plot to focus on and soon. Todd’s major character traits are his kindness, empathy and inability to say no. Here, he claims that he can be everything to everyone. Carol later asks Todd to help her out with her and Tandy’s fertility problems. It’s a little ambiguous to what this entails and knowing this show, it’s either going to be a medium deal for a few episodes or have significant repercussions that ruin character relationships — something they’ve done before and I’m not a fan of. As for the other characters, it seems like this show has no idea what to do with Erica except for a few quips here and there in group shots. That’s a shame because Cleopatra Coleman is a great actress. She’s always been underused too, and the character is the least developed of the entire cast. Overall, a decent episode but one that feels transitory instead of being its own thing and has several warning signs that this show could slip back into the good-but-flawed nature of the first season.